It was Friday 14th January and I woke up early in the morning, very excited. Today I was going to visit the new recording sessions of the last two Hitchhikers radio series based on “So Long…” and “Mostly Harmless”. Director Dirk Maggs and Producer Helen Chattwell (Above The Title Productions) kindly included me in the guest list for the day and so I gladly made the trip from Paris. Douglas’ friend and biographer Nick Webb gave me lodging for the night and provided me with great meals and long chats – if you have not read it yet, buy and read the excellent official Biography “Wish you were here : the official biography of Douglas Adams” he published in 2003 (Headline). You can bet I got dressed quickly that morning. But despite the map that Dirk emailed me, and the explanations carefully written by Nick, I managed to get lost and I was one hour late when I got to the Soundhouse Studios! When I entered the Soundhouse, a small but nice one storey building in the South West of London, I immediately recognised a familiar voice. It was Geoffrey McGivern (Ford in the radio series) chatting with other actors sitting on sofas, waiting for their turn to recording scenes. The others were Alison Pettitt and Bob Golding who provide some great voices for the new series. I was a bit nervous but Alison kindly offered me a tea and I sat deep in the sofa to listen with amazement to Geoffrey. It’s a very strange feeling to hear that guy talking with Ford’s voice, a voice that I heard so often and that I could recognize straight away, even if you played a song sung by a million robots at the same time! Geoffrey tells his stories in a very animated and friendly way, just like Ford really (Ford’s voice being a kind of exaggerated version of his own). I didn’t wait long. A nice and bright looking blonde sat down on the sofa besides me. It was Helen. Nice to finally meet her. With Bruce Hyman, head of Above the Title, they are responsible for the new versions of Hitchhikers radio series. A great challenge for them as you may guess. Hitchhikers is the BBC most successful and famous radio series. And I was soon to meet the other two key guys who made this new series. When I entered the control room with Helen, I first met with Paul Deeley. Paul is a very cheerful guy. He was sitting behind a huge console table, which is quite a naturally tenable position for a sound manager! On the other side of the big glass which separate the recording area and the control room, Dirk Maggs waved in a friendly way at me. Dirk made everything possible to make me feel welcome as a very special guest. For those who don’t know him I have to introduce Dirk. He is one of the most successful radio directors in Great Britain. He made some award winning versions of Superman, The Gemini Apes, An American Werewolf in London… He was also Douglas’s personal choice to write and direct the new radio series. Close to him, I spotted Kevin Davies, the guy who drew some of the TV series guide entries, made the TV series making of, the illustrated guide and the new radio series teaser. A legendary Hitchhikers figure which I met for the first time this summer during my visit to the movie set. Kevin is also one of the nicest chaps you’ll ever have the opportunity to meet in your whole life. Kevin was here to videotape the recordings in the expectation of the long awaited DVD audio of the new series which will luckily be released this summer. There were also two actors at the time in the recording area. None less than the legendary Simon Jones (Arthur in the radio and TV series, and the Magrathean Hologram in the upcoming movie) and also Jane Horrocks (a very skilled actress well known for her part of the mad secretary “Bubble” in Absolutely Fabulous). This day Dirk was recording the episode 4 of”So Long”. And the first bit of recording I heard is something you don’t expect to hear in the first place when thinking about Hitchhikers : a love scene, and a very moving and beautiful one I may add, between Arthur and Fenchurch. I will just say that Jane is perfect as Fenchurch. Her playing matches perfectly with Arthur and it is easy to believe in their love story. Of course I was very thrilled to see Simon Jones acting just in front of me and to hear new lines from Arthur. 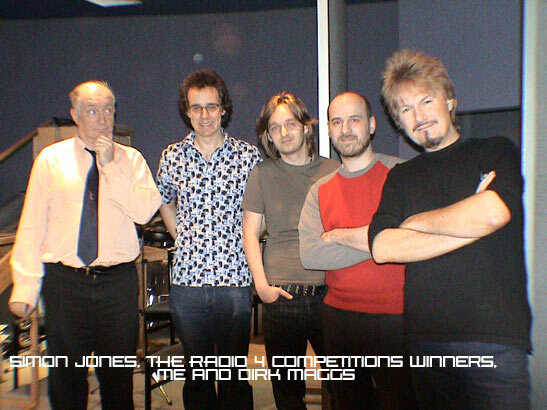 The morning, Dirk recorded all the remaining bits with Fenchurch as this was Jane’s last day on Hitchhikers. Dirk has got a quite impressive way to direct the actors. Always very kind with everybody, he knows exactly what he wants. He interacts a lot with the actors and he also listens a lot to them, making the recording really look like a collective job. There’s no much hesitation and time lost during the recordings. All goes very smoothly and rather quickly. While Dirk stays in the recording area with the actors most of the time, he also often comes in the control room to talk with Paul. I must say that I didn’t spend all the time in the studio. After the excellent buffet that we all shared, sat on the sofas, at 2 o’clock, I realized that I had the opportunity to talk with the actors during their pause. They all were very friendly and I had a nice chat with Geoffrey, Simon and the other actors. The mood was extraordinarily cool for such a big event. Alison Pettitt and Bob Golding went in the studio to record several parts each. They are obviously very talented, and both have a wide range of different voices. 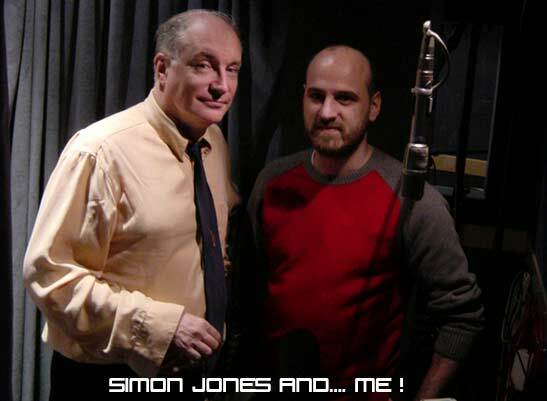 On the afternoon, I had the great pleasure to listen to excellent bits of dialogue between Simon and Geoffrey. Damn, these actors are geniuses. The way they find so quickly the right tone for their characters is amazing. Oh, and a few words about Ken Humphrey too. Ken is also a great guy and he makes the live sound effects during the recording. It’s very funny to watch him do the little noises which bring more life to the take while the actors play their part. We had the pleasure to welcome the Radio 4 website art competition winners , Nolan Worthington and Andrew Wyld (more about them on the excellent Radio 4 website) . They made some drawings for the new version of the Infocom adventure game and won a small part in the new recordings. And they’ve done their job very nicely. I was just a little taken aback when Dirk asked me to record a few words also. I just started panicking! But Dirk, and you see here that he is a very skilled director, finally managed to make me record these three words! Do I have to say how great this day was? Sorry if I sound much too enthusiastic, but this was quite a memorable event for me, and you have to meet all these chaps to see how nice they are. I really didn’t expect that. They had yet a week of recordings after my visit, and can I just say that there a lot of incredible guest stars which will be in the new series. My only regret is that I didn’t see Stephen Moore (Marvin), Mark Wing-Davey (Zaphod) and Susan Sheridan (Trillian) who are also my heroes. But maybe another time!